The Phoenix Islands Protected Area is a remote marine ecosystem known for its high biodiversity. 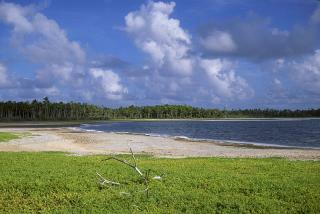 The area consists of eight atolls and two submerged coral reefs. The islands and surrounding areas are home to some 120 species of coral and more than 500 species of fish. They are located in the central Pacific Ocean. On January 28, 2008, the government of Kiribati formally declared the entire Phoenix group and surrounding waters a protected area, making its 410,500 square kilometres the world's largest marine protected area. The islands are all uninhabited, except for some fishermen and officials on Kanton. Formerly inhabited islands: Only 1 of the 8 Atolls is currently inhabited (Kanton - 24 inhabs). However in 1938 UK initiated the "Phoenix Islands Settlement Scheme". This is said by wiki to have been "the last attempt at human colonisation within the British Empire". The 3 Islands were then known as Gardner, Sydney and Hull. The scheme was not a success and the remaining families were evacuated in 1963. The islands are now officially "Uninhabited". Polynesia: The main islands of Kiribati(The Gilbert Islands), to which they belong, are considered part of Micronesia. But the Phoenix Islands lie significantly to the SE and are geographically within the "Polynesian Triangle". Also, although they are now largely uninhabited, there are Polynesian archaeological remains e.g "(Orona ) contains evidence of prehistoric Polynesian inhabitation. An ancient stone marae stands on the eastern tip of the island, together with ruins of shelters, graves and other platforms." Largest area: "The affirmative decision makes PIPA the largest and deepest World Heritage site in the world, covering an ocean territory more than 408,000 km2 (nearly 250,000 mi2, or roughly the size of California) and 6000 meters deep." Once Claimed for the USA: Claimed by US under the Guano Islands Act of 1856 ("federal legislation passed by the U.S. Congress that enables citizens of the U.S. to take possession of islands containing guano deposits. The islands can be located anywhere, so long as they are not occupied and not within the jurisdiction of other governments" - Wiki). UK also claimed them as part of Gilbert and Ellis. Situation not fully resolved until Treaty of Tarawa between US and Kiribati in 1979 when some (but not all) islands were "given up" by the US. Donald M Parrish Jr Jeff N.